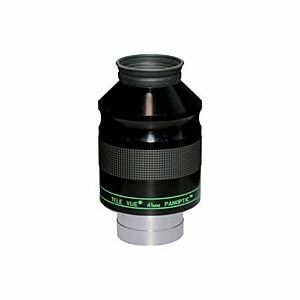 Televue 41mm Panoptic Eyepiece - 2"
All TeleVue Panoptic Eyepieces features multi-coatings, blackened lens edges, filter threads, rubber grip rings. Offers superb performance and outstanding eye relief in the 68 degree field class. This TeleVue Panoptic Eyepiece is 41mm, offers 27mm of eye relief and a 68º apparent field of view in a 2" barrel size. Standard features include eyeguard cover and undercut barrel for extra locking security in the focuser. All TeleVue Panoptic Eyepieces have a double identifying ring to easily distinguish them in the dark. With the Panoptic series, Televue has taken the Wide-Field concept to Naglerlike performance levels - A meaningful advance over any eyepiece in its 68 degree field class. The TeleVue 41mm Panoptic eyepiece is a big brother to the 24mm Panoptic (largest 1.25" field). With its 46mm field stop, the 41mm Panoptic delivers the largest 2" field possible. An adjustable and removable screw-type top allows quick, comfortable eye positioning. The scalloped shape gives a positive grip. Of course, multi-coatings, blackened lens edges, filter threads, rubber grip rings and exemplary construction are standard on all Panoptics. Little niceties such as a cover for the eyeguard, and an undercut in the barrel for extra locking security complete the package. A double identifying ring distinguishes all Panoptics in your eyepiece case. You can double the power of any eyepiece with the 2x Big Barlow, but adding the interface lens brings the pupil back to original position when used with long focal length eyepieces such as the Panoptic 41, 35, or 27mm 2" models. The combination of interface and Big Barlow mimics the Powermate concept.